Such is the bellicosity of humanity that any vision of the future that promises paradise, happiness, prosperity and serenity is lie. Mankind will inevitably be the cause of its own destruction, sowing the seed of annihilation within its own psyche long before any outside or other malign influence can cast its shadow on the species existence. As we hurtle toward this most tragic, and preventable of endings, the long whispered illusion of the Warhammer Universe and it’s version of our destiny begins to ring ever more true. In the future, there is only war, and in a far flung corner of this conflict blasted Universe, on a remote planet called Tranzia, the Doom Eagles, in a bid to swell their ranks with new initiates, rush toward their own demise as they become caught up in the threads of a web woven by magic and chaos. ‘The Tranzia Rebellion’ is a new, interesting and different concept for Black Library, being released monthly in ten minute chapters which adding a strangely nostalgic, almost “Golden Age” of Science Fiction undercurrent to proceedings as it harks back to the serialised radio plays and cinematic Saturday morning chapter plays and their inescapable cliff hangers. 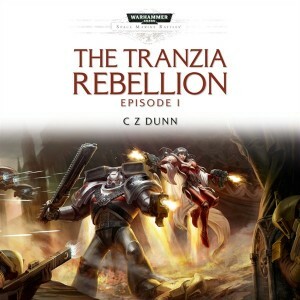 Condensing each part into ten minutes was never going to be an easy task, but the best of the Black Library’s writers (including CZ Dunn, Andy Smilie, Gav Thorpe, Nick Kyme and more) have managed to forge an engaging and riveting tale of treachery, destruction, rebellion (as you’d expect from the tales title), inquisition, seemingly hopeless causes, Eldar and eldritch influence and extraordinary and deviant alliances crafted from necessity, insane hope and in devilry. And as the Doom Eagles face the oncoming storm of the Tau and their confederates, the prospect of dying in battle becomes the lest of their worries, as they slowly realise the magnitude of the truth about the world on which they are fighting and are drawn inexorably closer to the architect of the whole affair. *’The Tranzia Rebelllion’ is released in thirteen monthly instalments, with the first twelve available for purchase now. The thirteenth and final part will released and available for order in, and from, December.